The Samsung Gear VR is a virtual reality head-mounted display mount developed by Samsung Electronics, in collaboration with Oculus VR, and manufactured by Samsung. The headset was released on November 27, 2015. When in use, a compatible Samsung Galaxy device acts as the headset's display and processor, while the Gear VR unit itself acts as the controller, which contains the field of view, as well as a custom inertial measurement unit, or IMU, for rotational tracking, which connects to the smartphone via USB-C or micro-USB. The Gear VR headset also includes a touchpad and back button on the side, as well as a proximity sensor to detect when the headset is on. The Gear VR was first announced on September 3, 2014. To allow developers to create content for the Gear VR and to allow VR and technology enthusiasts to get early access to the technology, Samsung had released two innovator editions of the Gear VR before the consumer version. The Samsung Gear VR  is designed to work with Samsung’s flagship smartphones. Currently supported are Galaxy S6, Galaxy S6 Edge, Galaxy S6 Edge+, Samsung Galaxy Note 5, Galaxy S7, Galaxy S7 Edge, Galaxy S8, Galaxy S8+, Samsung Galaxy Note Fan Edition, Samsung Galaxy Note 8, Samsung Galaxy A8/A8+ (2018) and Samsung Galaxy S9/Galaxy S9+. The device can be calibrated using the wheel at the top of the headset. A trackpad is located on the right of the device and back button is located just above it. Volume can be adjusted through the volume rockers also found on the right hand side. Some of the major goals Samsung set for this project regarding hardware were: that their headset could support MTP (Motion to Photon) latency less than 20 ms; the optimization of hardware and kernel; and also to create Galaxy Note 4’s QHD display that enables high-resolution rendering in the headset. The lenses field of view are 96° for the first three models and 101° for the R323. Oculus Home is the main facility to download and use content on the Samsung Gear VR. Oculus Home is also the main line for software distribution on the Gear VR. 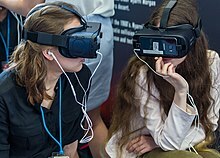 The primary appeal of the Gear VR is for mobile virtual-reality based gaming and simulations, however, recent interest is growing in the effective use of this device in science and medical education. Although the Samsung Gear VR consumer edition was released in November 2015, Samsung had obtained a patent on a HMD (Head Mounted Display) in January 2005. This was one of the first ideas of using a mobile phone as the display for a HMD. However, mobile phone technology at the time the patent was submitted limited the degree of quality and performance possible. Samsung continued to research VR and HMD internally. With the release of the Galaxy S4 in 2013, Samsung formed an official team dedicated to developing a virtual reality based device that would work with a smartphone. While this team developed multiple different prototypes, the performance and display (despite the Galaxy S4 having a Full HD display) were not yet up to standards. In 2014 Samsung partnered with Oculus (the creators of another well-known virtual reality device, the Oculus Rift) to help with the development. The Samsung Gear VR was unveiled during the Samsung press conference at IFA Berlin on September 3, 2014 (along with a smartphone capable of running it, the Galaxy Note 4). The first edition of Samsung's Gear VR, the SM-R320, was released in December 2014. This version was only compatible with the Galaxy Note 4. This edition was mainly released for developers so they could get an understanding of how the device worked and so they could create content which would be ready for the official release of the consumer version of the device. It also gave the chance for VR/technology enthusiasts to gain early access to the technology. The second edition of Samsung’s Gear VR, the SM-R321, was released in March 2015. This device supports only the Galaxy S6 and the Galaxy S6 Edge. A micro USB port is also added, to provide additional power to the docked device, as well as a small fan inside to prevent the lens fogging. The next edition, SM-R322, was simply referred to as the Samsung Gear VR. It was released on November 20, 2015. Pre-orders for the device went live on Amazon, Bestbuy and Samsung on November 10, 2015 and the device was sold out on the day of release. This edition has again a few minor changes compared to the previous iterations. First of all this edition supports six Samsung Galaxy devices so far: the S6, S6 edge, S6 edge+, Note 5, S7, and S7 edge. It is also 19% lighter than the previous Innovator Edition, it has improved ergonomics and a redesigned touchpad for easier navigation. The SM-R323 model was released alongside the Samsung Galaxy Note 7, and features minor changes, including an improved field of view, increased cushioning, a flat trackpad, and changes to the cover and body of the device to reduce glare. The model also utilizes USB-C connector instead of USB Micro-B so that it could be connected to the Note 7. The port is also capable of data transfer. Adapters are provided for use with older devices using micro USB connectors. On October 11, 2016, in observance of a recall and discontinuation of the smartphone, the Gear VR was made incompatible with the Galaxy Note 7 for safety reasons. An updated model, SM-R324, with support for the larger Galaxy S8 was unveiled on 29 March 2017, for release alongside the phone on 21 April 2017. Samsung also unveiled a handheld Gear VR Controller accessory, which is bundled with the updated model, and will be available as a standalone accessory for existing devices. It remains compatible with existing supported devices. An updated model, SM-R325, with support for the larger Note 8 was unveiled on 15 September 2017, for release alongside the phone. Samsung also unveiled a handheld Gear VR Controller accessory, which is bundled with the updated model, and will be available as a standalone accessory for existing devices. It remains compatible with existing supported devices. ^ "Samsung Confirms 5 Million Gear VR Mobile Headsets Sold To Date". ^ "Samsung Gear VR - Specs". samsung.com. Retrieved October 10, 2015. ^ "Samsung Explores the World of Mobile Virtual Reality with Gear VR". samsung.com. Retrieved June 11, 2017. ^ "Earn 1.57% Cashback on Samsung Gear VR". ^ "Samsung Gear VR consumer edition goes on sale in the US". TrustedReviews. Retrieved November 26, 2015. ^ "What are the buttons on my Samsung Gear VR Innovator's Edition, and what do they do?". Samsung Electronics America. Retrieved November 26, 2015. ^ "Gear VR: How Samsung makes Virtual Reality a Reality". Samsung Electronics Official Blog: Samsung Tomorrow. Retrieved November 24, 2015. ^ "Samsung Gear VR review". Engadget UK. Retrieved December 10, 2015. ^ "Samsung Gear VR review". Cnet. Retrieved October 16, 2016. ^ Moro, Christian; Štromberga, Zane; Stirling, Allan (November 29, 2017). "Virtualisation devices for student learning: Comparison between desktop-based (Oculus Rift) and mobile-based (Gear VR) virtual reality in medical and health science education". Australasian Journal of Educational Technology. 33 (6). doi:10.14742/ajet.3840. ISSN 1449-5554. ^ "Samsung Gear VR consumer edition goes on sale in the US". Trusted Reviews - The Latest Technology News and Reviews. Retrieved November 26, 2015. ^ "Introducing the Samsung Gear VR Innovator Edition". www.oculus.com. Retrieved November 24, 2015. ^ "Samsung Gear VR now available for pre-orders at $99". www.oculus.com. Retrieved November 24, 2015. ^ "Leak: Samsung's new Gear VR has wider field of view, works with Note 7". ^ "New Gear VR redesign doesn't fix what wasn't already broken last year". Ars Technica. Retrieved September 1, 2016. ^ O'Kane, Sean (August 2, 2016). "Samsung gives the Gear VR a facelift". The Verge. Retrieved October 4, 2016. ^ "Oculus disables Gear VR on Galaxy Note 7 over safety fears". The Verge. Retrieved October 11, 2016. ^ "Samsung Galaxy S8's VR headset delivers refined graphics, so-so controller". Polygon. Vox Media. Retrieved March 30, 2017. ^ "Samsung's Gear VR may be the Galaxy S8's greatest fringe benefit". CNET. CBS Interactive. Retrieved March 30, 2017. ^ "Which Galaxy smartphones are compatible with which Gear VRs?". Samsung. Retrieved August 23, 2018. ^ "Specifications Gear VR Compatibility". Samsung. Retrieved October 30, 2018. Wikimedia Commons has media related to Samsung Gear VR.